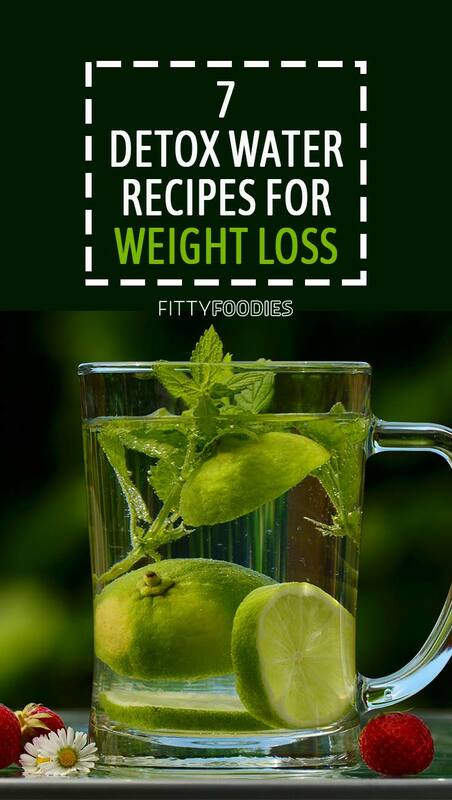 Detox water recipes for weight loss may be exactly what you need to get your weight loss going! Drinking enough water is crucial for keeping your body healthy and functioning properly. It boosts your metabolism, eliminates toxins and waste from your body and makes you feel healthy, happy and energetic. So it’s no surprise that water is also a major component of your weight loss diet. It helps with your workouts, it is essential for burning calories, and helps to reduce your appetite to avoid those annoying cravings! Although many people recognize the importance of water and the role it plays in weight loss and overall health, some just don’t like it and avoid drinking it. 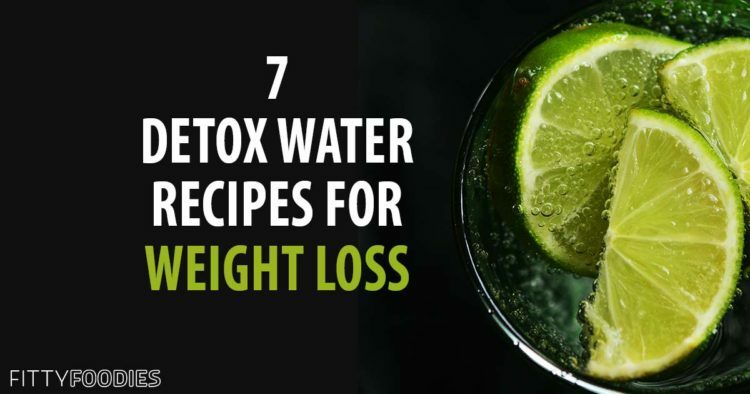 Well, if this is the case for you, you should definitely check out the following detox water recipes for weight loss! 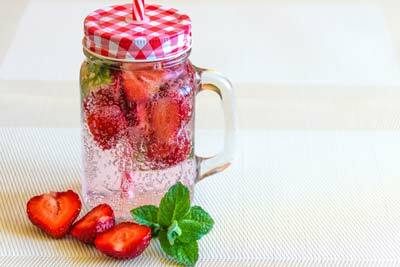 You’ll surely start to view water differently once you find out how many different and delicious recipes there are for it! Plus, these recipes will help you reach your daily water intake goals much easier! You can calculate what your daily water intake for weight loss should be by clicking here. There’s nothing like a refreshing cup of this detox water! The lemon provides you with some vitamin C, keeps you hydrated, ensures the health of your skin, helps with digestion and even freshens your breath! The minty fresh leaves will give your drink some sweetness without needing any sugar and, most importantly, it will sooth your stomach and improve digestion. And the cucumber will do wonders for your skin as it is rich in vitamin B-5, which even helps with getting rid of acne. Not to mention, it will eliminate the toxins built up in your body. What is there not to love? A simple, refreshing, delicious detox water you need to try out NOW! Here’s another one of the delicious detox water recipes for weight loss with an autumny hint. The apples are very rich in fiber, antioxidants and flavanoids. They also help a lot with digestion and improve brain health, as well as prevent various diseases. Cinnamon is also loaded with antioxidants, lowers blood sugar levels and is perfect for spicing up your detox water! Who doesn’t love a delicious slice of watermelon on a hot summer day? Well, have you ever considered making some delicious watermelon detox water? Watermelon is filled with nutrients, improves your heart health, has anti-inflammatory properties, and even helps get rid of soreness in your muscles. Next time you’re slicing up a watermelon, be sure to keep a slice for your detox water! Once again, another antioxidant-filled, blood sugar-reducing, refreshing and delicious detox water recipe! Strawberries are actually a great choice for weight loss as they are very low in calories (100 grams only have about 30 calories!!! ), have a relatively low glycemic index, and are filled with fiber! Pomegranate does wonders for digestion, has lots of vitamin C and has anti-inflammatory qualities. This detox water features oranges which are loaded with vitamin C, which are great for your immune system and control your blood sugar! The blueberries are a superfood when it comes to weight loss. They are very low in calories (100 grams only have about 55 calories) but filled with nutrients. Also, blueberries are one of the best foods when it comes to antioxidants. So definitely try out this immune-boosting, vitamin and nutrient-filled delight! This delicious citrusy detox water consists of lemons, limes and oranges. Citrusy fruits are great because they are full of vitamin C and nutrients, protect your immune system, and are a great source of fiber. Plus, they are perfect for weight loss as they are low in calories. 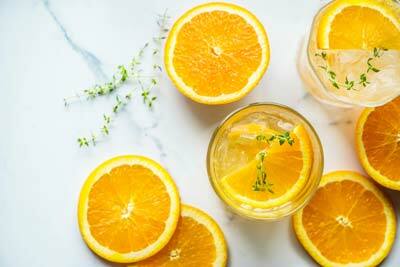 And citrus fruits are absolutely delicious, so this triple-citrus detox water is amazing inside and out! This is one of my favorite detox water recipes for weight loss! It’s a perfect fun and colorful summer refreshment. 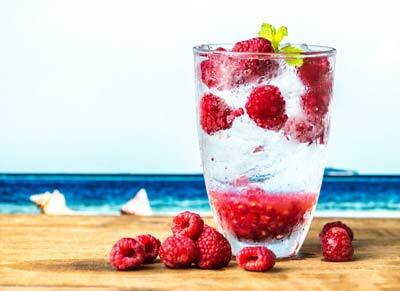 The raspberries are a great source of vitamins, antioxidants and fiber and help a lot with digestion. They are also low in calories, making them perfect for weight loss (100 grams have 50 calories). 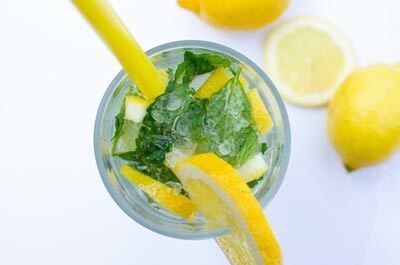 The lemons are a great source of vitamin C, will help with digestion and keep your breath fresh! So these were some of my favorite detox water recipes for weight loss! They’re perfect for you if you don’t drink enough water and need a little taste in it without adding any unnecessary sugar. But remember, these detox water recipes may be suitable for weight loss but don’t expect that drinking them will automatically melt fat. In order to lose weight effectively, you need a precise diet plan which would tell you exactly what to do and what to eat. We recommend The 2 Week Diet which will be your helpful buddy during your weight loss journey! Don’t be scared about the workout part if you’re not someone who enjoys working out. The workouts are very simple and easy and can be done from the comfort of your own home, meaning you won’t have to get a gym membership if you don’t have one already! Also, if you’re a vegan or vegetarian, don’t worry that you’ll only find meals suitable for meat eaters. The 2 Week Diet is adapted to different eating habits so you’ll get a meal plan suitable for your lifestyle. The diet plan also features a 100% money back guarantee. So literally, you have nothing to lose besides those pounds!